Many people believe that fairies exist. In his book Supernatural: Meetings with the Ancient Teachers of Mankind, Graham Hancock tells the story of how Jeanne d’Arc reported to her inquisitors that she had hung wreaths on a tree that was known as the “Tree of the Fairies.” People involved in religions such as Wicca or nature-based spiritual practices regularly work with the fairies. Popular authors such as Doreen Virtue and Ted Andrews write about the fairies and help people to connect and work with the fairies. Almost everyone connecting or working with nature spirits at some point contemplates creating a fairy garden in order to encourage them to come around. It isn’t difficult to create a fairy garden, but you need to know what fairy preferences are in order to entice them. Fairies raise the energy of their environment by their very presence. According to Virtue, fairies vibrate at a higher level than humans, though their frequency is not as high as that of the angels. Fairies care for all flora and fauna, and they will also sometimes help humans. In her book Fairies 101, Doreen Virtue explains how fairies can help with manifesting one’s desires, including more income, a better job, better health, or new and better relationships. They will also help in the garden itself by keeping out any animals that become pesky if you let them know that the animal has become a nuisance. Fairy aficionados say that fairies care about the environment. So it is important to first have a clean and garbage-free yard. Make sure that litter gets picked up. Take anything to the dump that should be at the dump. Give away or recycle what no longer serves. Composting will also endear the fairies to the family that does it, as will using the green bin. Virtue points out that fairies do not like perfectly manicured lawns and gardens. They are nature spirits, wild and free, and they love an environment that is untamed. They will not enter a garden that uses pesticides or herbicides. Poisons offend and repel them. It’s said that fairies love shiny objects, water, statues and anything that adds beauty to the garden. Some people string “fairy bait,” strands of shiny beads or crystals, on the trees, or use garden gnomes and statuary to add some charm. Since the fairies love to be around water, ponds or waterfalls are always great to have in the garden. Twinkling lights around the yard also provide the right ambience. 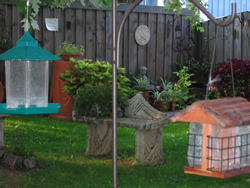 Attract the birds and animals that fairies are said to enjoy playing with and caring for by installing birdhouses, planting foliage that attracts them and adding birdbaths. Butterflies and dragonflies are also associated with the fairies, so planting flowers that draw them will also bring the fairies. Having fairies in the garden will require some extra care and concern on the part of the humans using the garden. Virtue cautions that anyone about to walk on or cut the grass should send a telepathic warning to the fairies that a human is about to intrude. Without this warning, fairies may be injured by mower blades or indiscriminately placed footfalls. Living with the fairies is an experience that everyone should cultivate, as it has many benefits. Whenever fairies move into a garden, everything begins to thrive, and the garden becomes a true oasis of serenity and joy. Andrews, Ted. Nature-speak: Signs, Omens & Messages in Nature, Jackson: Dragonhawk Publishing, 2004. Andrews, Ted. Enchantment of the Faerie Realm, Revised Edition, Woodbury: Llewellyn Publications, 2008.